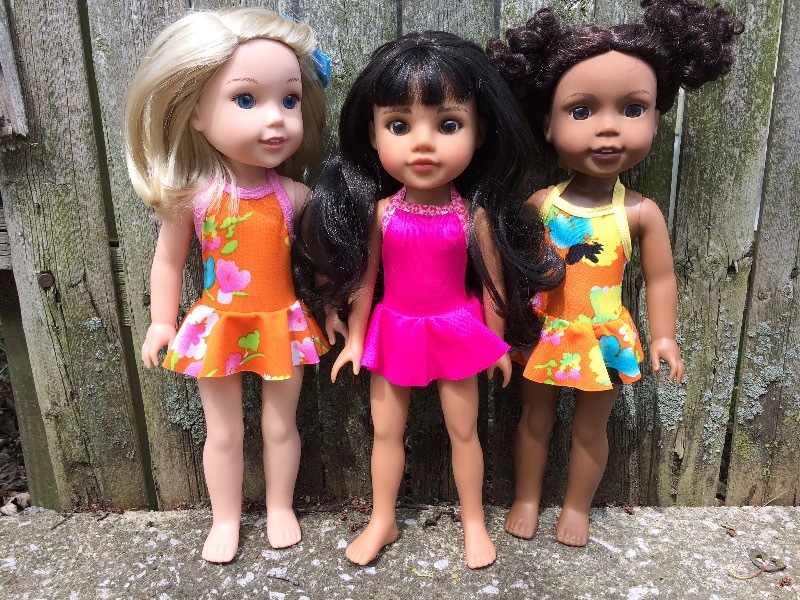 Splashing around in the water, these little 14.5” doll cuties are bound to create Wild Waves in their one-piece skirted swimsuits by Peppermintsticks. The carefree one-piece suit features a wavy skirt, with fold-over elastic trim around the top and back of the suit. It pulls on easily and has a snap closure at the neck. Mix and match bright colors, polka dots or animal print swim fabrics with fun shades of the fold-over elastic to make a wild waves combination all your own. The PDF sewing pattern also contains instructions for making a little matching headband from the fabric scraps and elastic. Embellish it with a tiny decorative button and it makes a fun fashion accessory. 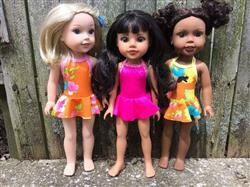 Look for the Wild Waves Swimsuit pattern in the popular 18” doll size, also available at Pixie Faire. Easy to sew - went together perfect the first time. I LOVE that you don't need to hem the skirt. Have made several suits using this pattern and different fold-over elastic trim. It is easy to sew and fits perfectly. Love the pattern. Good instructions. I loved making this darling swimsuit and my Willa loves wearing it. Easy and sweet. Make several!